Clement (knee) still figures to have a role after the Eagles traded for fellow running back Jordan Howard, Zach Berman of The Philadelphia Inquirer reports. The Eagles still haven't provided any details on the nature of the season-ending knee injury Clement suffered in Week 14, Andrew Kulp of NBC Sports Philadelphia reports. Clement (knee) likely will have some limitations during the Eagles' offseason program, Zack Rosenblatt of NJ.com reports. Clement (knee) was placed on injured reserve Tuesday. Analysis: The Eagles haven't publicly commented on the results of the MRI that Clement required Monday, but the running back's move to IR implies that he was likely looking at a multi-week recovery timeline. With Clement officially shut down for the final three regular-season contests and a potential postseason run, Darren Sproles checks in as the top change-of-pace option behind starter Josh Adams, while Wendell Smallwood also slides up a spot on the depth chart. Clement is expected to be sidelined for at least Sunday's game against the Rams after sustaining a right knee injury in the Week 14 overtime loss to the Cowboys, Ian Rapoport of NFL Network reports. Analysis: Clement played just seven snaps (four on offense) before exiting with the injury, for which he required an MRI on Monday. The results of Clement's exams aren't known, but the team's decision to sign fellow running back Boston Scott off the Saints' practice squad implies some level of concern about the former's Week 15 availability. If Clement is in fact sidelined versus the Rams, Darren Sproles and/or Wendell Smallwood could take on enhanced roles behind starter Josh Adams. Clement will undergo an MRI on Monday as the Eagles look to determine the severity of the knee injury he suffered in Sunday's 29-23 overtime loss to the Cowboys, Ian Rapoport of NFL Network reports. Clement (knee) has been ruled out of Sunday's game in Dallas. Clement injured his knee during Sunday's game at Dallas and is questionable to return, Dave Zangaro of NBC Sports Philadelphia reports. Analysis: Clement's right leg was rolled up on at the end of a first-quarter carry. He remained on the turf for a spell before needing assistance to get to the locker room, according to Martin Frank of The Delaware News Journal. If Clement is unable to reenter the contest, Darren Sproles will serve as the primary pass-catching back Sunday and perhaps beyond. Clement carried five times for 27 yards and caught all three of his targets for 47 yards in Monday night's 28-13 win over Washington. Clement played 24 of the Eagles' 65 offensive snaps (37 percent) in Sunday's 25-22 win over the Giants, finishing with five carries for 45 yards and two receptions for 31 yards. 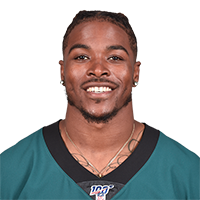 Clement is expected to see his role within the Eagles' backfield committee decline beginning with Sunday's game against the Giants with the team planning to start Josh Adams and feature him more prominently moving forward, Ian Rapoport of NFL Network reports. Clement rushed twice for 11 yards and caught both of his targets for four additional yards in Sunday's 48-7 loss to New Orleans. 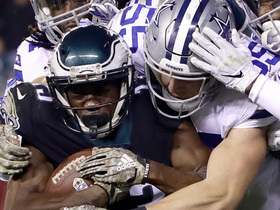 Analysis: Clement saw his fewest carries all season as Josh Adams handled the bulk of the backfield work, which was already scant because the Eagles fell behind by three scores early in the second quarter. The Wisconsin product has not surpassed 22 yards in any of his last four games and likely isn't going to see an increase in chances with Adams playing well. If the 24-year-old has a silver lining, it's that Philadelphia heads into a favorable matchup for running backs against the Giants at home Week 12. Clement played just 18 of 62 snaps (29 percent) on offense in Sunday's 27-20 loss to Dallas, taking five carries for 13 yards and catching one of two targets for a loss of five yards, Dave Zangaro of NBC Sports Philadelphia reports. Analysis: The snap split was pretty even between Clement, Wendell Smallwood (21) and Josh Adams (19), but only the latter had any success turning his playing time into rushing production. The undrafted Adams took seven carries for 47 yards, while Smallwood caught three passes for 30 yards and added two totes for four yards. Clement hasn't given the Eagles any reason to increase his role ahead of a Week 11 road matchup with the stingy New Orleans run defense. Clement (illness) doesn't have a designation for Sunday's contest versus the Cowboys. Clement (illness) took part in Friday's practice, Dave Zangaro of NBC Sports Philadelphia reports. Analysis: Clement sat out Thursday's session due to his ailment, but it appears he only needed the lone day off to feel better. It remains to be seen if he will be listed on the Eagles' final injury report of the week, but even if he is, he figures to be available for Sunday's matchup with the Cowboys. Clement was listed as a non-participant in Thursday's practice due to an illness, Mike Kaye of NJ.com reports. Analysis: The nature or severity of Clement's ailment isn't known, but the Eagles will hope that his condition improves enough to fit in some practice time Friday. Assuming the illness doesn't prevent him from playing Sunday against the Cowboys, Clement will likely work as the secondary option in the Eagles' backfield committee behind Wendell Smallwood. Smallwood has outpaced Clement in offensive snap count in each of the Eagles' past three contests. Clement rushed for six yards on four carries and caught his lone target for minus-1 yard in Sunday's 24-18 win over the Jaguars in London. Analysis: Clement has just 27 scrimmage yards over the past two games, while Josh Adams and Wendell Smallwood both exceeded 60 scrimmage yards out of the backfield in this game alone. Jay Ajayi's knee injury created extended opportunities for the rest of Philadelphia's backfield, but Clement hasn't been the one capitalizing on them in recent weeks. He and the rest of the Eagles will be on bye in Week 9. Clement carried eight times for six yards and caught two passes for 16 more yards during Sunday's 21-17 loss to the Panthers. Analysis: Clement finished just one carry behind Wendell Smallwood for the team lead, but he did next to nothing on the ground as he averaged just 0.8 yards per carry. He hauled in both balls thrown his way, but he did little outside of an 11-yard gain and finished with his lowest scrimmage yardage total since Week 1. Clement had made a splash in recent performances and will look to bounce back next Sunday against the Jaguars. 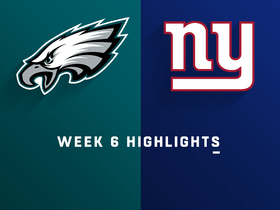 Clement rushed 11 times for 43 yards and a score and brought in all three of his targets for 26 yards in the Eagles' 34-13 win over the Giants on Thursday. Analysis: Although Wendell Smallwood's 18 rushing attempts outpaced him by a good margin, Clement was the more effective back of the two on a per-touch basis Thursday. The second-year pro was slated to see a relatively limited workload Thursday after having recently dealt with a quadriceps injury, so he and Smallwood could conceivably flip-flop lead-back duties in a Week 7 matchup against the Panthers. Coach Doug Pederson confirmed Clement would play Thursday against the Giants, Graham Foley of the Eagles' official site reports. It's expected that Clement will see increased snaps for the immediate future with Jay Ajayi (knee) out for the season. Clement (quadriceps) indicated Tuesday that he will play in Thursday's game against the Giants, Les Bowen of the Philadelphia Daily News reports. Analysis: With Jay Ajayi (ACL) lost for the season and Darren Sproles' (hamstring) status up in the air, Clement could be contending with Wendell Smallwood and possibly Josh Adams for carries during Thursday's matchup with the Giants. Clement's estimated full participation Tuesday furthers the notion that he will suit up for the contest. He toted the rock 16 times in Week 3 with Ajayi out of commission, suggesting he will likely be first in line for the lead role in his absence. Clement (quadriceps) was listed as a full participant in Tuesday's practice, Zack Rosenblatt of NJ.com reports. Clement (quadriceps) was estimated as a full practice participant on the Eagles' injury report Monday, Zach Berman of The Philadelphia Inquirer reports. Clement's teammate, Jay Ajayi (knee), has been placed on IR. Analysis: Clement was active, but did not see any snaps, in Sunday's 23-21 loss to the Vikings, as he's been dealing with a quad injury. Once fully healthy, however, he'll be a candidate for added work in the wake of Ajayi's injury, as will Wendell Smallwood. Meanwhile, Darren Sproles, who has missed time with a hamstring injury, should reclaim a share of the team's change-of-pace duties upon his return. Clement (quadriceps) is listed as active Sunday against the Vikings, Dave Zangaro of NBC Sports Philadelphia reports. Analysis: Despite failing to practice in any capacity this week, Clement unexpectedly avoided the inactive list, but he'll have to contend with healthier options Jay Ajayi and Wendell Smallwoord for touches out of the backfield. There's a chance Clement is an insurance policy in case one of Ajayi and Smallwood get injured, especially after the duo racked up 135 yards from scrimmage on 24 touches last Sunday at Tennessee. Clement (quadriceps) didn't practice at all this week and is listed as questionable for Sunday's game against Minnesota, Martin Frank of The Delaware News Journal reports. Analysis: The failure to log any sort of practice participation suggests Clement is more likely to sit than to play, but his status may not be known for sure until the Eagles release their inactive list approximately 90 minutes before Sunday's 4:25 p.m. EDT kickoff. With Darren Sproles (hamstring) already ruled out, Wendell Smallwood is a candidate to see double-digit touches while working behind Jay Ajayi in a backfield that always uses multiple players. Clement (quad) wasn't present for the start of Friday's practice, Zack Rosenblatt of NJ.com reports. Analysis: Coach Doug Pederson said Clement would return to practice, but it now seems the second-year running back is absent for a third straight day. With Darren Sproles (hamstring) also missing from Friday's session, the Eagles appear to be headed for another week featuring Wendell Smallwood working behind Jay Ajayi in the backfield. Clement (quad) will practice Friday and the Eagles will make a call on his Week 5 status after the session concludes, Zack Rosenblatt of NJ.com reports. Analysis: Clement didn't practice either Wednesday or Thursday, but he's at least slated to see at least some work Friday. Per head coach Doug Pederson, the Eagles' final injury report of the week will reveal whether or not Clement has a chance to take the field Sunday against the Vikings. Clement (quadriceps) was held out of practice Thursday, Zack Rosenblatt of NJ.com reports. Analysis: Clement was a spectator for a second straight session, which he watched without a helmet, per Zach Berman of The Philadelphia Inquirer. With no activity yet this week and healthier options available to the offense -- Jay Ajayi and Wendell Smallwood -- Clement may remain sidelined for another game Sunday versus the Vikings. Friday's injury report will peg Clement's chances of taking the field Week 5. Clement (quadriceps) didn't practice Wednesday, Zack Rosenblatt of NJ.com reports. Analysis: Clement was held out of Sunday's 26-23 loss to the Titans after playing through the same injury the previous week when Jay Ajayi wasn't available. Coach Doug Pederson labeled both Clement and Darren Sproles (hamstring) as day-to-day ahead of the Week 5 game against the Vikings. Coach Doug Pederson labeled Clement (quad) as day-to-day during Wednesday's media session, Sheil Kapadia of The Athletic reports. Clement (quadriceps) is inactive for Sunday's contest at Dallas, Tim McManus of ESPN.com reports. Analysis: Clement played through the quad injury last Sunday against the Colts, when he notched 75 yards on 19 touches with both Jay Ajayi and Darren Sproles (hamstring) out of commission. However, Clement will join Sproles in street clothes Week 4, leaving the backfield work to Ajayi and Wendell Smallwood. Clement (quadriceps), who is listed as questionable for Sunday's game against the Titans, is expected to play, Ian Rapoport of NFL Network reports. Clement (quad) is listed as questionable for Sunday's game in Tennessee, Daniel Gallen of PennLive.com reports. Clement was a limited participant in Thursday's practice due to a quadriceps injury. Clement rushed for 56 yards on 16 carries and added 19 yards on three receptions during Sunday's 20-16 win over the Colts. He fumbled twice, but recovered both. Clement (quadriceps) will make his first NFL start Sunday against the Colts, Zack Rosenblatt of NJ.com reports. Clement (quadriceps) is active for Sunday's game against the Colts. 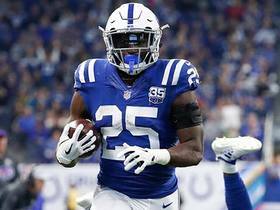 Clement (quad) was added to the injury report Friday and is listed as questionable for Sunday's game against the Colts, Zack Rosenblatt of NJ.com reports. Clement rushed six times for 30 yards and a touchdown while catching five passes for 55 yards in Sunday's 27-21 loss to the Buccaneers. Analysis: Clement saw nine of his touches while Jay Ajayi nursed a back injury in the first half, though the second-year pro split 10 carries evenly with Wendell Smallwood over that time. The 23-year-old racked up 59 total yards and burst through a wide-open hole for a 15-yard touchdown to tie the game at seven in the second quarter. The 2017 undrafted free agent probably won't be in line for such a large workload Week 3 against the Colts unless both Ajayi and Darren Sproles (hamstring) are unable to go. Clement is likely to take on a larger role with Darren Sproles (hamstring) ruled out for Sunday's game in Tampa Bay, Zach Berman of The Philadelphia Inquirer reports. Clement rushed for 26 yards on five carries in Thursday's 18-12 win over the Falcons. Analysis: Clement rushed four times for just two yards until his 21-yard fourth-quarter burst converted a key third down and set up the game-winning touchdown two plays later. The Wisconsin product saw 10 fewer touches than Jay Ajayi and had as many rushes as Darren Sproles, although the latter saw seven targets in the passing game as well. As such, Clement remains the third-best option in Philadelphia's backfield when the team hosts Tampa Bay in Week 2. Clement (lower body) returned to practice Sunday, Martin Frank of The Delaware News Journal reports. Analysis: Meanwhile, Jay Ajayi (lower body) was held out of practice once again. It remains to be seen if he's in any danger of missing Week 1, but if he's out -- or limited at all out of the gate -- Clement would be in line for added opportunities. Clement (lower body) is considered day-to-day, with the expectation of ramping up his practice workload next week, Graham Foley of the Eagles' official website reports. Clement (undisclosed) won't suit up for Thursday's preseason contest in New England, Derrick Gunn of NBC Sports Philadelphia reports. Clement is dealing with an unspecified lower body injury and should be ready for Week 1, Jeff McLane of The Philadelphia Inquirer reports. Analysis: Clement has been held out of practice the past five days after taking five carries for 30 yards in last week's preseason opener versus the Steelers. He'll presumably miss Thursday's exhibition in New England, but Eagles coach Doug Pederson doesn't sound too worried about Clement's availability for the regular season. The second-year pro is expected to work in a backfield committee with Jay Ajayi and Darren Sproles, running behind one of the best offensive lines in the league. Clement (undisclosed) isn't practicing Tuesday, Dave Zangaro of NBC Sports Philadelphia reports. Clement (undisclosed) isn't practicing Monday, Dave Zangaro of NBC Sports Philadelphia reports. Clement (undisclosed) remained on the sidelines for Sunday's practice, Eliot Shorr-Parks of NJ.com reports. Analysis: Given that he also sat out Saturday's practice, the second-year back likely picked up an injury during the Eagles' preseason opener Thursday against Pittsburgh. According to Zach Berman of the Philadelphia Inquirer, Clement was wearing a sleeve on his right leg, which suggests that could be the location of the injury. The Eagles haven't commented on the injury, so it's simply a situation to keep an eye on for now. Clement (undisclosed) will not participate in Saturday's practice session, Jeff McLane of The Philadelphia Inquirer reports. Analysis: Clement may have been dinged up in the process of totaling 32 yards in Thursday's preseason opener, though the team will likely provide a more detailed account of his absence from the session afterward. With the second-year back on more stable footing in terms of a 53-man roster spot than he was as an undrafted rookie last season, Clement has less incentive to rush back to the field if he's dealing with an issue this preseason. Clement gained 30 yards on five rushing attempts and caught both of his targets for a total of two yards in Thursday's 31-14 preseason loss to Pittsburgh. Analysis: Clement showed why he has a firm spot in the Philadelphia backfield when he rushed for at least five yards on each of his first four carries and also flashed his pass-catching chops. The former undrafted rookie's emergence began late last season and continued in the postseason, and he's in line for a possible breakout this year behind starter Jay Ajayi. Clement expects a larger workload this season, though he acknowledged there's a lot of competition in the Philadelphia backfield, Paul Domowitch of The Philadelphia Inquirer reports. 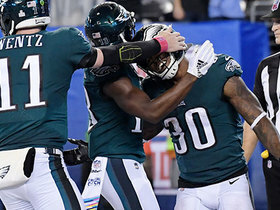 Clement rushed just three times for eight yards but hauled in four of five targets for a team-high 100 yards and a touchdown during the Eagles' 41-33 win over the Patriots in Super Bowl LII on Sunday. He also returned one kickoff for 25 yards. Clement carried the ball four times for 17 yards and caught his lone target for one yard in Sunday's 34-29 defeat of the Giants. Analysis: The 10 offensive snaps were the fewest he's played since Week 6 at Carolina, but he saw his usual allotment of between five to seven touches for the fifth straight week. He'll be a risky play Week 16 versus Oakland. Clement carried the ball six times for 24 yards and caught one of three pass attempts for 28 additional yards in Sunday's defeat of the Rams. Analysis: The seven total touches were the rookie's most since Week 9. His 27 snaps came just one shy of his career high, while LeGarrette Blount saw just 15. Nevertheless, the Wisconsin product's role in the Eagles' offense is the least valuable among their running back trio. He is not a recommended option in Week 15 against the Giants. Clement played 28 snaps on offense in Sunday's 24-10 loss to the Seahawks, gaining seven yards on three carries and catching all three of his targets for 30 yards. Clement gained 27 yards on four carries and 12 yards on one reception in Sunday's 31-3 win over the Bears. 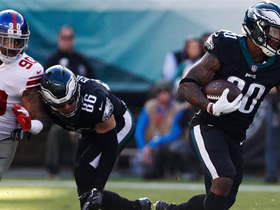 Clement rushed six times for 50 yards and a touchdown in Sunday's 37-9 defeat of the Cowboys. He also converted a two-point attempt. Analysis: The undrafted rookie capped the first drive of the second half with an 11-yard run up the middle for a score that put the Eagles up for good. Despite seeing half the touches that he did Week 9, Clement managed to reach 50 yards in his third consecutive game. 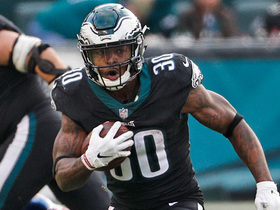 His emergence, alongside Jay Ajayi's arrival, certainly makes the Philadelphia backfield a three-headed monster as they head into a Week 12 matchup at Chicago. Clement ran for 51 yards and two touchdowns on 12 carries and added another score on a 15-yard reception in Sunday's 51-23 win over the Broncos. 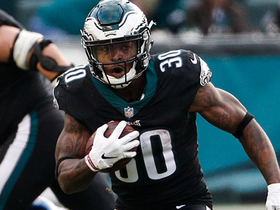 Philadelphia Eagles running back Corey Clement breaks loose for 23 yards on a screen pass from quarterback Carson Wentz. Philadelphia Eagles tight end Zach Ertz leads the way on this Eagles two-point conversion. 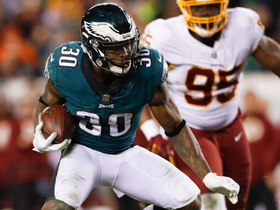 Philadelphia Eagles running back Corey Clement breaks tackles on this impressive 23-yard gain. Dallas Cowboys linebacker Leighton Vander Esch comes up with a crucial third-down stop. 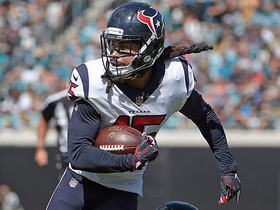 The "NFL Fantasy Live" crew discuss which fantasy players surprised them in Week 7.